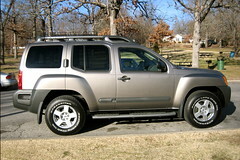 I bought a new car yesterday: a 2005 Nissan Xterra. While the MINI has been fun for the last 14 months, I need something bigger and capable of going off the pavement. If I could afford to have a second car for myself, I’d pick the MINI hands down. It’s a blast, but not very practical for my lifestyle. The Xterra is about the only “real” mid-size SUV left. The rest of them are just tall cars (Honda Pilot, Toyota Highlander) or are insanely expensive (Toyota 4Runner). The Xterra is a real truck, with real 4 wheel drive with a low range. I really like the aesthetics of the Xterra, too, especially on the inside. Outside, it’s a little butch. But, the inside is very cool. The dash layout is very minimalist and clean. The cargo compartment, instead of being carpeted, is rubberized, so it’s easy to clean. It really feels like home to me. Previous Previous post: 101 Days of D&D: okay, would you believe 43 Days of D&D?